Since currently I am into K-Car (Kancil aka Mira) modification, I would like to share some information about this. As everyone knows that Kancil and Mira (L5 or L2) share almost everything including the dashboard. As for me, I don't really like Kancil dashboard because of the outdated design. So I made up my mind to change to Mira L5 dashboard where it looks nicer to me. 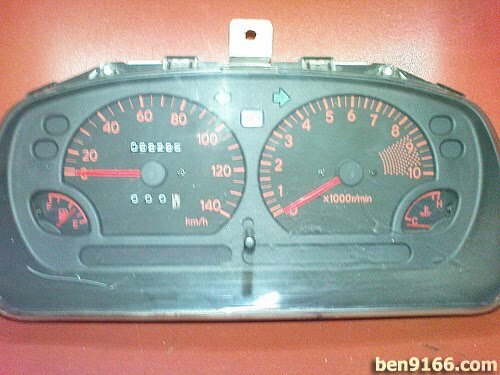 However the meter of the Kancil does not really fit in to L5 dashboard and it is a must for anyone who change to L5 dashboard to change to the L5 meter as well. For those who love to DIY the installation of L5 dashboard, here is the meter wiring for L5 matching to Kancil 660/850. For L2 meter wiring matching to Kancil 660/850 is over here. Plus, there are 15 wire from my 850 kancil.. The table above only shows 13 wire...what happen to another two wire?? Sorry that I have no experience in L6 meter. Sorry that I do not have experience with the 180km/h L5 meter. If I got chance to play with it, will post the diagram out here. Sorry that I have no idea on the seatbelt indicator with turbo kick in. Please refer to DIY: Apex-i S-AFC and Turbo Timer Air Flow Installation Diagram for the diagram. Bro..can u share l9 wiring diagram from computer box to fuse box? is this for l5 red meter only? It is applicable to other L5 models as well. in there mistake in ur diagrm.turn right pin out for kancil is green.and l5 is purple white. Thanks for correcting me for the pin color. 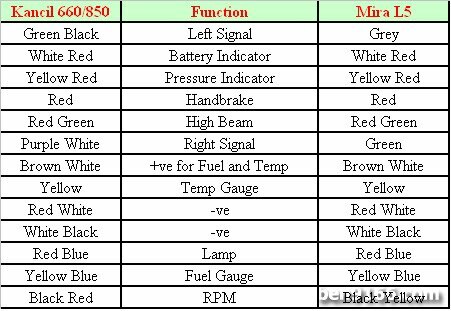 I have meter l5 with rpm but it white.the problem now the color wire that you mention certain not same,can you advice me how to wiring meter l2 to l5 white color.for example black yellow,not rpm coz i see it for check ingine.need your help..thnks a lots..
was searching the net and came across your blog. Nice Mira/Kancil you got there. Do all Kancil's over there have the tachometer? I own an L2 850 with just a speedometer. I found a dash with the tacho, but it has 2 seperate plugs at the back. Mine only has 1 big one. So I'm after 2 of the plugs to use on a dash with speedo and tacho. Hoping you might help. I bought meter l2 and want to install to standard kancil 660 without rpm..
After transfer all the wire from my car to the l2 socket meter..all meter and indication light are functioning..only rpm meter not functioning..from the socket i have 4 wires extra..but from my car not have more..